Well, the car was in my hands for almost three years (2 months shy), that is longer than I've owned any car since the first Project350z left my hands in September 2006. 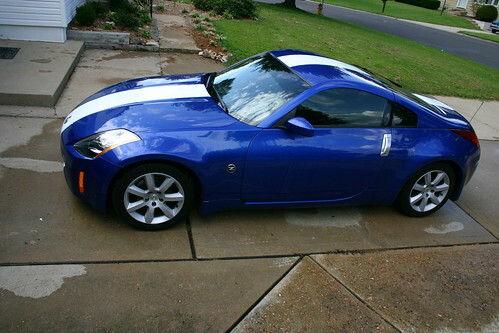 One day perhaps I will own another 350z, it isn't in the plans right now, but never say never I suppose. The time is nearing for when the 350z must be sold, so if you are interested hit me up 2004 350z Enthusiast, <75k miles, currently sits stock other than a K&N CAI and a Plenum spacer, and a grounding kit (installed by previous owner). Also has a receiver mounted to the rear bumper that I use for a bike rack. The car is well maintained, looks great with lower than usual wear and tear of an 8 year old car. I also have the suspension still in boxes, see previous posts for more details, but TrueChoice Koni DAs up front and SA Koni Sports in the rear with springs/perches for the rear. This will be sold separate from the car, unless the buyer wants it for additional $$. Car is located in Half Moon Bay, CA, and available for purchase at $9,000, if you want the suspension throw in another grand and you can have it all. Alright the time has come to part with the parts. I took some time this evening to take photographs of what I have and what I am trying to sell. Right now I am trying to sell everything locally so prices don’t include any shipping. If I don’t have any interest locally I’m willing to ship the coilovers/springs/shocks but only as a package. So what did you do this weekend? Did you spend two days under your car? I basically did, well more like 1 day, but it was broken up over an afternoon/evening and then the following morning after I ran to get a new “nut” that I needed to finish things up. Why was I under the 350z? Well, removing the fun parts of course. I planned to remove the front and rear Hotchkis sway bars, along with the TrueChoice Phase 4 Konis (front) and the off the shelf Koni Sports (rear) along with springs/perches. Though in order to deal with the rear sway bar I also ended up pulling the Injen Super SES exhaust system off the car as well and put the OEM exhaust back on. This morning I began the process of converting the 350z back to stock, or close to stock. Mike Lane over on the east coast requested the control arms/custom bushings that I have on the car, so he sent me his original OEM set. A couple of months ago I actually tried to remove the arms on my car so I could lube them up and try to get rid of some of the excess noise in the car, but I wasn’t able to. One of the nuts on the upper strut mount was stuck and no matter what I tried I wasn’t able to get the nut removed. I picked up some tools from the local Ace Hardware in Half Moon Bay to get that pesky nut off, and this morning when I got started, things didn’t go well. I managed to break an extension I was trying to use, then I managed to break the bolt extractor as well! I was not a happy camper, though I decided to try one more thing, a better quality extension and turning it by hand. After that nut was removed replacing the control arms was nice and easy. So the first parts of the car are back to stock, I’m shipping out Mike’s new control arms early next week, and hopefully they will see some autocross action soon! Today was the first event in the San Francisco Region’s slush series. I decided to head out and try to dust some of the rust off, and last night decided to build a camera mount for the car. After seeing the GoPro HD Hero2 launch video, I decided it was time to try to start getting more interesting video. Earlier this week I attempted to do something interesting with video on my bicycle for www.bicycletips.com but the video turned out pretty bad. For the 350z I wanted to try to get the camera up and behind the car. Not just on top of the car, but a couple feet back and above the car. So I got the building, really I didn’t build much, just assembled some parts that I had, and that I picked up from the local Ace Hardware store here in Half Moon Bay. I kind of liked the white stripe on my old 350z. I’m still thinking I will wrap this one, but the stripe got me reminiscing. What do you think of the stripe? Yay or nay? Add a comment below and let me know! I can’t believe it, but tonight after work I came home and washed, rain-x’d and waxed the Mazda CX-7. We’ve owned it since December, and this is the first time I’ve put wax on it. I’m so ashamed, I don’t know if I have ever owned a car (besides the 240z) that ever went that long without getting waxed. Even the Turbobird got waxed and it was a huge mess. The CX-7 was a mess, as is the 350z right now. One of the downfalls of living in Half Moon Bay, if you don’t park your cars in the garage (we don’t currently have room) they WILL be wet almost every morning. Perhaps this weekend I can get the garage cleaned and come up with room for at least one of the cars. If you want to read the details, check out yesterday’s post. If you want to see the video, you are in the right place! So the time finally came, or I finally got around to it, the hitch is now on our 2004 Nissan 350z. The hitch is a Curt Hitch for the 350z, available via Amazon. I purchased it quite a while ago, but haven’t taken the time to get the car apart and install it. Today that all changed. To get the hitch on the car, you first have to remove the rear bumper fascia from the car, that’s fairly simple to do, remove the rear tail lights, remove 6 or so screws, 4 clips, and pull. The 350z Service Manual is helpful for this. Here are the photos from the American Autocross Series Round 8 from 7/3/2011. The car is of course our 2004 Nissan 350z in half prep for B Street Prepared. Unfortunately I don’t have times, but let’s see if I can recall the order of the runs. I’ve been doing some work on SOLO2.ORG the past two evenings, working on restoring a bunch of my old blog posts from over there from the early days of the site. There was a lot of content that went missing over the various conversions of the site the past 4-5 years. 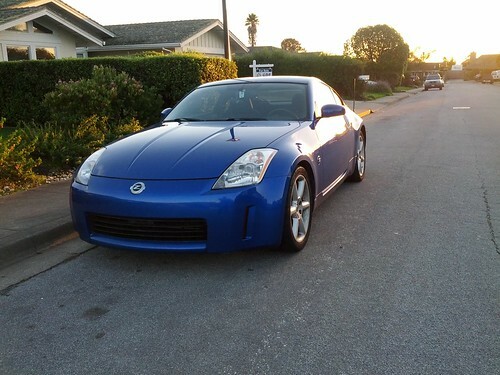 I managed to bring a number of the posts back, and found a lot of old posts about my original 2003 350z (the current one I have is a 2004), at which point in time I just called it Project Z (rather than Project350z). So I finally had it with listening to my Motorola Droid (Google Music and Pandora) for my commute. Why don’t I have a stereo? Well back in February I ripped it all out. Not exactly the best choice, but hey, I was in the hear of the moment thinking I was prepping the car for a fully competitive 2011 season. That has changed, (more on that later). This evening, after work and taking Pylon to the vet (he’s got a ulcer or something in his eye) I took 40 minutes to put the new hitch on the Mazda CX-7. I ordered a Curt trailer hitch for our 2010 Mazda CX-7 from Amazon on Thursday, it arrived today. Why would we need a trailer hitch on the Mazda? Bicycles of course! A couple of weeks ago we got Natalie a new bike, a hybrid, a Cannondale Quick CX-3. I wanted to get one as well, but we decided to hold off a bit as we planned for the move. Well, my wonderful Auntie Carol sent me a graduation gift! Which I am going to use to buy myself a bike! The problem we have is that the Mazda isn’t big enough to put a bike, at least comfortably inside, much less two of them. Of course we could get a roof rack for the CX-7, but I really didn’t want to stick a rack on top, for the aesthetics and the noise. I also want to be able to take a bike or two behind the 350z, and I sure as hell couldn’t (wouldn’t) put a roof rack on it! So a trailer hitch attachment is our best option. I’ve got a trailer hitch for the 350z (though it is not installed yet), so it was just a matter of getting the hitch for the Mazda. The installation was super easy, basically the process was to. 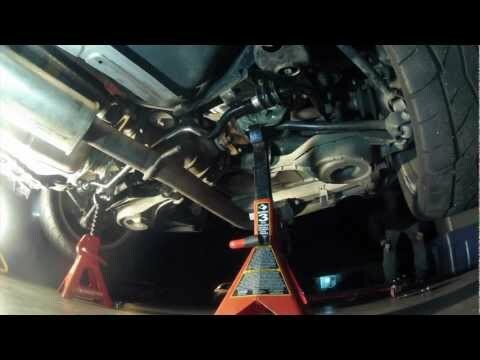 1) Remove the 4 rubber hangers for the exhaust to let it move out of the way (resting it up a jack stand as to not put too much pressure up stream. 2) File a frame hole on each side of the car to be side enough for the bolts and spacers to fit into the frame. 3) Fish the bolts and spacers in. 4) Tighten the nuts (75 ft/lbs) 5) Reattach the exhaust. Pretty simple, I didn’t clock myself, but I can’t imaging it took more than 40 minutes. to get on. Tomorrow I’m hoping to go get the bike and a trailer hitch bike rack. I’ll post more when that happens. I have thought for a while now that I should do some SiteMap integration for a couple of modules, but I honestly never got around to getting it done. The basics are pretty straight forward for getting a SiteMap integrated with your custom modules. I won’t recreate Chris’ blog post here, but basically you need to create a new class, and populate a list of SiteMapUrls. Depending on your module, and it’s content, that may or may not be difficult. I think I’m going to implement the sitemap for the next release of the Wiki module, should be fairly straightforward. I realized recently that I didn’t have an ongoing list of modifications for the 350z. So I figured I should create one. The idea is that this will be continually updated, with the list of current parts. If I end up removing parts I’ll strike them through on the list. So things have slowed down for the Project350z, at least for a month or two. After running quite a few events in February, March and April, I haven’t run an event since the El Toro ProSolo on 4/10. I plan to run more events this year, but life has put autocross to the side for a month or two. We’re getting ready to move, so autocross has been the last thing on my mind. This weekend there’s the Dual at DeAnza, last year I was hoping to run this year’s event, but due to everything going on I ended up not registering. It looks like Grant (ShamuZ) has lost his car for the event, due to losing a rear diff (He’s got an OS Giken diff as far as I know, I need to find out what happened as that is the diff I was hoping to put in my car later this year). I’ve asked Grant to see if he can get me into his entry position for the Duel, if he can I will try to run the event. If it doesn’t work out, so be it, but I think it would be cool to run. The next few weeks are going to be extremely busy, so an autocross before all of that would be a good release! A week ago I posted a “question” on Facebook to see what color we should wrap the 350z in. 13 for Don't Do It! So Matte Black it will be! Time to order the vinyl! I would hope to have it done by the end of the month, but realizing we are moving before then, we’ll set a goal of the end of June to have this completed. Of course we’ll have a time lapse video of the process! I took all of this stuff out of my car a few months ago and am just now getting around to selling. To the best of my knowledge here is what I have, you can find all the pictures from below (and more) at a higher resolution at http://www.flickr.com/photos/chammond/sets/72157626520108688/with/5628927973/ All equipment is used, but was in working order when removed from the car. What color should I wrap the 350z? You get to decide! So I’ve wanted to do this for a while, and now I’m getting ready to pull the trigger. I am going to wrap the 350z? What does that mean? I am going to take a solid Vinyl color, and wrap it around the entire painted surface of the car. Effectively changing the color of the car, and covering the paint in a protective vinyl coating. Why am I wrapping the car? Because I can? Or well, because I want to. I don’t know yet that I can. I’ve applied quite a bit of vinyl in my life, but never to an entire car. Why not have someone else wrap it? Why not have a designer wrap done? Both of those options cost money, and I really would rather spend money elsewhere on the car. That being said, if you own a car wrapping business in the San Francisco Bay Area and you want to sponsor Project350z, fill out the Contact form on the About page. What color are you going to wrap it? That’s where you come in. We’ve setup a "Poll" on our Facebook page, where you get to help us decide. The options are "Matte Black, Matte Green, Don’t Do it!" If you have a Facebook account go ahead and answer the question! The Poll will stay open until 5/4/2011. And while you are at it, don’t forget to "LIKE" our page! For the past few days I’ve been working on a new DotNetNuke skin for Natalie’s website. I’m nearing completion on it! I’m hoping to have it up over the weekend, and if all goes as planned, I’ll be using the layout (with color/graphic modifications) for ChrisHammond.com and even an overhaul of Project350z.com. So the car is naked, well about as naked as it can be. Saturday evening I took it to the car wash and removed all of the vinyl. I plan to put it back on, but it’ll be a while before that happens. I figured it was a little too much right now to attract attention. I’d post photos, but there really isn’t much point, right now the car is just a blue 350z that is a little lower than normal. So what happened? Well, I’m sitting in 5th out of 8, 2nd in the Kumho class. I’m still hoping to get up to first in the K Class With the contingency available that would mean a set of tires. Jodi Fordahl is driving with me as well. She’s doing great, I have a feeling she’ll be faster than me on Sunday. Random note: This car really needs a diff! I am going to try to find the OS Giken guys if they are at the Pro tomorrow and talk to them a bit.